The honey bee, Apis mellifera (L.), is our most beneficial insect. We must do all we can to protect bee colonies which are pollinators for many of our home and commercially grown fruits and vegetables. The annual contribution of honey bees to food production in the United States is estimated to be $10 billion. Honey bees are important as primary pollinators of almonds, apples, blackberries, blueberries, cantaloupes, cranberries, cucumbers, forage crops, kiwi fruit, squash, and watermelons. Annual cash receipts of South Carolina commercially grown apples, cantaloupes, cucumbers, and watermelons are estimated at $25 million. In South Carolina, there are about 2,500 beekeepers who keep bees for pleasure and profit. They manage about 30,000 honey bee colonies which produce 1.2 million pounds of surplus honey annually in addition to the pollination service which many people take for granted. Honey bees will defend themselves if threatened. Avoid disturbing a bee colony unless you are fully protected. If you encounter bees that are flying and appear to be out of control, simply walk away slowly without swatting at the bees. Swatting the bees only irritates them more. If you find yourself being attacked by defensive bees, cover your head with your shirt and run quickly through dense vegetation or seek shelter in a vehicle or building. The guard or worker honey bees have a barbed stinger that is left behind in the victim. In the process of stinging, a honey bee rips a portion of her abdomen away with the stinger and the bee dies soon. The stinger should be removed immediately from the victim to reduce the amount of venom entering the sting site. A preferred sting remedy is to place a mound of common table salt on the point of sting entry and dampen with water. By osmotic pressure, most of the venom will be withdrawn from the body tissue if the treatment is applied within 3-4 minutes following the stinging incident. When working outside, it is advisable to carry small amounts of salt such as the packets found at fast food restaurants. Honey bee swarming season normally occurs in South Carolina during the months of May and June, although there are exceptions. This is the time of year when swarms may enter the wall of structures and become a pest problem. A swarm will enter a void or cavity that averages about 10 gallons (40 liters) in size. Normally, honey bees favor a cavity entrance that faces southeast and is about 1.5 inches (38 mm) in diameter. A European honey bee colony will swarm normally once a year whereas an Africanized colony will swarm several times annually. Swarms occur in spring during strong nectar flows when the colony population outgrows its living quarters. The old queen and about half the bees will emerge from the parent colony to find a new home. The parent colony has made preparations to replace the old queen prior to swarm emergence. When the swarm emerges, the bees will cluster on a nearby tree limb or other object and remain there from an hour to sometimes twenty-four hours. Scout bees are dispatched to search for a new home for the swarm while the queen and remaining bees await their return. The swarm will fly en masse to the new home described by the most convincing scout bee. The new home may consist of a hollow in a tree, a vacant beehive, an abandoned water heater, a cavity in a wall of a structure, or any other void that meets the specifications of the scout bees. If a property owner suspects that a honey bee colony has entered the wall of a structure, he/she should attempt to confirm the insects are indeed honey bees. Other possible insects that might invade the wall of structures are carpenter bees, yellow jackets, or European hornets. Honey bees vary in color from yellow to black, have black or brown bands across the abdomen, and are much smaller than a carpenter bee. Honey bees are about 2/3 of an inch long and the body is covered with setae or hair. The foraging honey bees will have pollen baskets on each hind leg which will be often loaded with a ball of yellow or dark green pollen. The honey bee is the only stinging insect that can normally overwinter as a colony inside the wall of a structure in South Carolina. The carpenter bee can be identified by having bright yellow, orange or white hairs on the thorax and a black shiny abdomen on the dorsal side. Carpenter bees are robust, heavy bodied bees that range 3/4 to 1 inch in length. These insects bore half inch wide holes that appear to be perfectly round on exterior wooden surfaces. Yellow jackets lack the dense body hair that are found on carpenter bees and honey bees. The foraging yellow jackets do not have the pollen baskets on the hind legs. The yellow jacket is about .5 inch long and the abdomen is characterized by having alternating yellow and black bands. European hornets are much larger (1.5 inches long) than honey bees and sometimes establish colonies inside structural walls. NOTE: The property owner must first decide whether to seek out a professional to do the job. Some beekeepers have much experience in honey bee removals and will remove the bees for a fee, but sometimes a carpenter will be needed to assist in reconstructing the wall. If you do not know a local beekeeper, you should call your Clemson University Cooperative Extension Office which may have a listing of local beekeepers. Also, some pest control companies have employees who are trained in bee removal. The honey bee colony should be salvaged alive if possible, but sometimes this not practical. Honey bee swarms that have recently entered the wall of a structure say for a day or so can often be exterminated by injecting a pesticide recommended for bee control into the cavity. The bees should not have had time to construct a significant amount of comb, produce much brood, or store much honey unless a very strong nectar flow is in progress. Remember that if the bees have stored much honey in the wall and you kill the colony with a pesticide, the honey will be contaminated with the pesticide. Foraging bees from another nearby managed or feral bee colony will be attracted to the honey in the wall and may cause other unnecessary colony demise. To avoid this problem, caulk or place window screening on all potential entrances to the wall cavity such as knot holes and cracks in siding. This will prevent another swarm from entering the same cavity the next swarm season, too. A foul odor is to be expected for several weeks in the vicinity of the decaying bees if removal is not conducted. Once the bees have setup housekeeping for more than a few days, the job often becomes more difficult. Sometimes, much comb (beeswax), brood, and honey are stored in the wall of a structure. Simply injecting a pesticide in the wall to kill the bees and leaving is risky. The comb will attract wax moths and mice for nesting sites. The honey will attract ants and other insects and may ooze through the wall or ceiling when comb melts during hot weather causing extensive damage. A term called "neutralization" is necessary to get the job done right and avoid problems down the road. Neutralization involves the complete physical removal of all bees (dead or alive), comb, and honey from the wall following extermination to prevent future infestations. The removal process should be scheduled when no humans or pets are in the immediate area. A good wash down of the cavity with soapy water is recommended to remove all odors of the previous colony. If possible, it is a good idea to leave the void area open for a couple of weeks to allow drying and dissipation of colony odors. Filling the void prior to wall closure with spray foam insulation or fiberglass batting will prevent the space from re-colonization. Depending on the exterior wall construction, the neutralization process may have to be conducted inside the structure, although exterior wall removal is preferred in most cases. The dimensions of the wall space occupied by the bee colony can normally be investigated in late evening by careful heat and noise observations. A stethoscope is a handy device to have when inspecting the size of the colony. An outline of the colony can be identified by carefully listening for a drastic decrease in the buzzing sound created by the bees. A light tap on the wall surface with a screw driver or hammer will elevate the noise intensity. The Walter T. Kelley Co. Inc. Removal of established bee colonies from structure walls can be made more pleasant by scheduling the job during the time of year when bee populations are low, a minimum of stored honey is present and the bees are less defensive. Early spring before the nectar flows have begun is the best time of year for bee removals in South Carolina. Another preferred time of year is late fall or on a mild winter day. Another suggestion for bee removal from a structural wall is to remove parts of the exterior wall and disrupt the colony during extremely cold temperatures. Honey bees cannot fly during freezing weather and the bees will normally die from exposure. The neutralization process can be completed much quicker during cold temperatures. Remember-- although bees might be unable to fly in cold weather, they can sometimes crawl and sting. So, you should observe the same safety precautions when working in cold weather. Exterior stucco, brick, or cement walls make normal removal impossible, especially if interior wall accessibility is not an option. Trapping bees out of the wall with a "one-way bee escape removal" is recommended if a property owner is not in a hurry to have the colony removed. The process will take about 2-3 months and sometimes it is not successful unless careful attention to detail is followed. The comb will remain in the wall and will attract another swarm in the future unless preventive measures are taken. 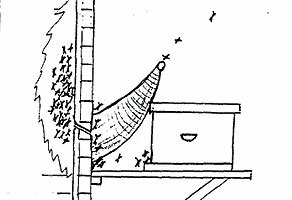 The cone shaped one-way bee escape is constructed of window screen with the large end fastened over the primary bee entrance. It is imperative that all other cracks or holes leading to the bee colony be sealed off or your efforts will be unsuccessful. A hive body with a new queen bee inside is placed on the platform with the entrance as close to the primary entrance as possible. Returning foraging bees will fly to the base of the cone shaped bee escape and will be unable to reenter the wall. Eventually, the foraging bees will successfully gain entrance to the adjacent hive. Periodic checks to make sure the bees have not gained entry into the wall are necessary. As the colony in the wall weakens, the colony in the hive body will strengthen at the expense of the parent colony. The queen in the parent colony will not normally abandon her brood so a non-residual pesticide or CO2 should be injected into the wall to kill her and the remaining bees. Make sure the fumigant used does not leave a toxic residue. After a few days, the cone escape can be removed and the bees from the new hive will enter the wall and remove the remaining honey. All possible entry sites must be sealed or plugged to prevent re-colonization by future swarms. Filling the void with an expanding foam type of insulation is highly recommended. Unfortunately, this trapping procedure requires many visits to the site to finish the job. The comb left behind in the wall will be highly attractive to scout bees in the future , therefore the structure owner should make annual inspections of the wall and refill any cracks or holes leading to the cavity. Safety Around Honey Bees. One percent of the human population is allergic to bee stings. These individuals should take every precaution to avoid bee stings because one sting can be immediately life threatening. An available prescription sting kit is highly recommended for these individuals during outside activities. WARNING: Honey bee removal from structures is not a job for a person who has never worked around stinging insects or even a novice beekeeper. Sometimes, this work is done while standing on a ladder with hundreds of angry bees trying to protect their home. Bee removal can be unnerving to even the experienced beekeeper and lead to accidents. This information is supplied with the understanding that no discrimination is intended and no endorsement by the Clemson University Cooperative Extension Service is implied. Brand names of pesticides are given as a convenience and are neither an endorsement nor guarantee of the product nor a suggestion that similar products are not effective. Use pesticides only according to the directions on the label. Follow all directions, precautions and restrictions that are listed. EIIS/AP-3 (New 09/1998).